Potala is the most admired monumental structures in Tibet. While circumambulating the palace by following the pilgrim’s path, we can note different aspects and moods of the sophisticated design from varying view points. This massive edifice embodies the best of 17th century, Tibetan architecture, no buildings, before or after, compare with it. The view of the holy city from the roofs is unforgettable. Naming the Potala, A minister of King Songtsen Gampo in the 8th century was the first Tibetan to be sent to India for advanced Buddhist studies and also the country’s first translator, having rendered a number of Sanskrit texts into Tibetan. In one of these he mentioned that Riwo Potala, the mystical abode of Chenresi, it seems plausible that Sambhota coined the name of Potala. The most poignant areas are the roof terraces housing the Dalai lamas’ residences and the large courtyard known as Deyang Shar. From the historical and religious point of view, two tiny chapels, the Phakpa Lhakhang and the Chogyal Drubphuk, both within the white palace, are the most important. Their style is significant for being neither overtly Chinese nor Indian inspired; the statues are probably the works of an artist familiar with the idioms of central Asia. The Potala’s most sacred statue, the Aryal Lokeshvara is inside the Phakpa Lhakhang, the holies shrine for pilgrims. Eight dalai lamas are entombed within the Potala. The most spectacular are the elaborate ornate burial Chorten of the fifth and the thirteenth. As a counterpoint to these massive relics spend sometime in the Dukhor Lhakhang, which houses an intricate three dimensional Mandala. The two great halls of the red and white palaces, Tshomchen Shar and Tshomchen Nub give some respite from the dark chapels. The Potala has never been severely damaged. Unlike most Tibetan monasteries, it was not sacked by red guards during the 1960 and 1970s. As a result all the chapels and their artifacts are remarkably well preserved. The Potala is open every day from 0900-1600, except Sunday, when it is closed. Expect long queues on Wednesdays, and Saturdays, traditional days for pilgrims, when it is open all day. Some parts of the Potala may be locked during lunch. Norbulingka place known as jewel park is one of the most relaxing part of Lhasa and 40 hectare enclave on the outskirts of town, full of trees, ponds, gardens, palaces, and pavilions. Since the mid of the 18th century it has been official summer residence of Dalai Lama. It has four major complexes; Kelsang, Tsokyil, Takten Migyur, and Chensel. Chensel is the centerpiece of Chensel lingka, the western half of Norbulingka. The palace consists of no less than 400 rooms and chapels. It lies at Lhasa’s west end. Norbulingka was started by the seventh Dalai Lama, Kelsang Gyatso (1708-57). The eighth Dalai Lama, Jampel Gyatso (1758-1804), spent time here in meditation and was responsible for one of the summer palace’s rigorous expansion. He built the Chora, the Tsokyil Potrang, the Lukhang Lho, Druzin Potrang, the perimeter walls of the park’s southeast section. After the death of 13th Dalai Lama in 1933, the 14th Dalai Lama built his new palace north of the Chensel Potrang and called it Takten Migyur Potrang. The name signifies that Buddhism is eternal and unchanging. This was the last major construction at Norbulingka. Jokhang temple is Tibet’s most sacred place, where pilgrims come from all over the country to pay their homage. It is located in the heart of Lhasa. Jokhang is focus of devotion day and night. Multitudes of Tibetans circle it while going round and round Barkhor, gaining spiritual merits and have a wonderful time. This temple was built by King Songten Gampo in the 7th century but Jokhang exact date of construction is still not known. In the pilgrimage season, long queues of pilgrims wait patiently for hours just to touch their foreheads to the sacred image of Jowo Sakyamuni. These are short column in front of the Jowo Chapel and the door frames of the inner chapels (tsangkhangs) on the ground floor and second floor. These spectacular works of art, the earliest in Tibet, attest to the sophisticated cosmopolitan nature of the Yarlung Dynasty (7th -9th century). Accomplished Newari artists from Nepal, versed in the fabled art of Gupta India (4th- 7th century) created them. The four ground floor inner chapels with original door frames are Thuje Chenpo, Wopame, Jowo Sakyamuni , and Jampa Gonpo. Of the second floor inner chapels with rare door frames, one stands at the center of the destroyed north wing; the other two are on either side of the Zhelre Lhakhang, itself a recently discovered repository of 12th –Century, murals inspired by the Pala tradition(9th -11th century). As late as 1985, 7th century murals adored the north gallery. These unique relics have now disappeared, brutally detached from the walls. Songtsen Gampos principal chapel is also a highlight of this floor. On the top floor, one of the chapels that draw the most pilgrims is that consecrated to Palden Lhamo, the divine protectress of Tibet. 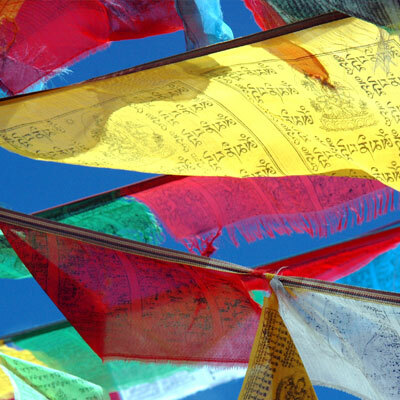 The Jokhang retains design details that go back to the royal period (7th-9th centuries). Drepung means rice-heap which comes from the Sanskrit Dhanyakataka, the name of stupa in south India where the Buddha first taught the Kalachakra Tantra. The monastery is located 8 km west of Lhasa. With an area of over 20,000 sq m, its principal buildings are the Tshomchen, the four main tratsangs, and the Ganden Potrang. Each of these has its own residential units, Khangstens and other functional buildings. The major structures follow a simple architectural plan. Each consists of a courtyard, a large hall and inner chapels. 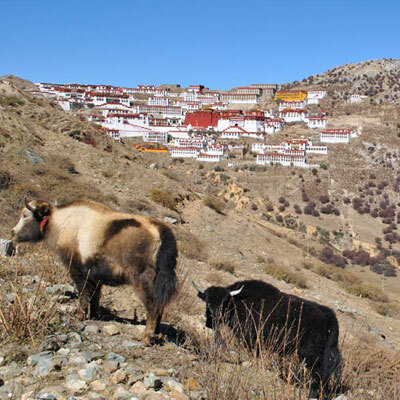 Dominated by a high ridge known as Gephel Utse, Drepung was founded by Jamyang Choje in 1416. This celebrated yellow hat lama was born near Samye to a wealthy family (a childhood friend donated large sums for the building of Drepung). With the contribution of rich families and feudal lords, he announced plans to create a great monastery One year after commencement, the monastery had become home to 2000 monks. By the time of the Fifth Dalai lama (1617-82), its population had grown to a staggering 10,000 monks. Pilgrims move through the complex in a clockwise sequence from the parking lot fronting the main entrance: Ganden Potrang, Tshomchen, Ngagpa Tratsang, Jamyang Lhakhang, Loseling Tratsang, Gomang Tratsang, and the Deyang Tratsang. Sera is one of the Gelugpa’s six great monasteries (the other five are Drepung, Ganden, Tashilhunpo, Labrang, and Kumbum). Sera lie at the base of Phurpa Chok Ri, a mountain of the Tatipu Range that defines the northern limit of Lhasa city. It was founded in 1419 by Sakya Yeshe (1355-1435), a principle disciple of Tsong Khapa. The complex today, a veritable monastic city, occupies a site of nearly 12 hectares. It is made up of the Tsokchen Great hall), three tratsangs, and 30 Khangstens. A Khangsten is a residential compound with chapels reserved for monks coming from different areas of Tibet, whereas a Tratsang is a college that offers specialized studies, headed by its own abbot (khempo). It was a vital center for religious activity and Sera boasted over 5,000 monks and novices. It is one the best preserved monasteries in Tibet, its principal buildings were in explicably spared during the Cultural Revolution. Pilgrims follow a well trodden route when they visit the main chapels. The basic clockwise sequence is Sera Me, Ngagpa Tratsang, Sera Je, Hamdong Khangsten, Tsokchen, Tsong Khapa’s hermitage. Yumbu lagang, reputed to be the first palace in Tibet history, is also one of the oldest buildings in Tibet. The present Yambhu lagang is a reconstruction of the original building. Lying 12 kilometers/7 miles southwest of Tsedang, it perches on a small hill east of the Yarlong River. It built over two thousand years ago by the bon followers, for the first Tibetan king – Nyatri Tsenpo, who was said to have descended from Heaven, although through extension, the palace gradually became a Buddhist monastery. Trandruk Monastery is famous throughout Tibet since it was the first Buddhist chapel ever built in Tibet around 7th century. Trandruk is one of the earliest and most ancient Buddhist monasteries in Tibet among Yarlung Valley, having been founded at the same time as the Jokhang and Ramoche in Lhasa. It was name Trandruk (Falcon-Dragon) due to fact that bird first saw the lake and it made strange cry of Dragon. The name “trandruk” means roc conquering a dragon. Trandruk Temple, which is at the south foot of the Gungbort Mountain, lies five kilometers (three miles) south of Tsedang on the road leading to Yumbu Lhakhang. The Pearl Thangkas Painting preserved in the temple is a precious treasure. High up on Mure Mountain in Chonggye County, its a large imperial graveyard with nine massifs. These variably sized earthen structures are the tombs of Tibetan kings who governed from the 7th to the 9th century. Originally of similar size and shape-high and square with flat top-some of the tombs are now round or otherwise eroded. Here, in the Graveyard of Tibetan Kings, it is the largest preserved imperial graveyard in Tibet, the nine recognizable tombs stand as reminders of the rich history and lore of ancient Tibet. Over the hundred years, its characteristics and shapes has changed and become rounded on top. Samye is recognized as the first monastery of Tibet, the place where monks were trained and ordained for the very first time. It played vital role in advancement of Buddhism in Tibet. It served as a royal temple Samye’s inception began in the second half of the 8th B.C, when King Trisong Detsen invited to Tibet the Indian Buddhist masters, Guru Rinpoche, Santarakshhita, and Karmalasila as well as Chinese monks from the Tang court. The main court of Samye is Utse, also known as Tsuglag Khang. The design was a synthesis of Tibetan, Chinese and Indian sensibilities. It was founded in 1902; this largest monastery of the region once had over 500 monks and nuns. 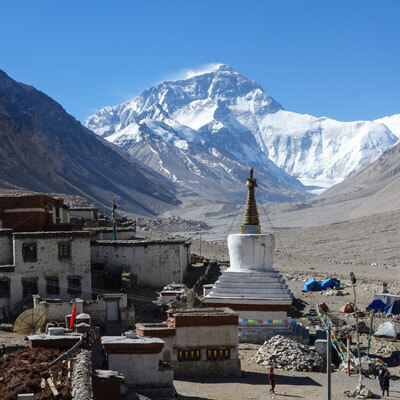 It is located at the foot of the Rongbuk Glacier, near Mt. Everest’s North face Base Camp. A couple of centuries before the complex was built, a small group of nuns in meditation huts braved the severe conditions regularly experienced at the sobering altitude of 4980m. By 1940 the year of Ngawang Tenzin Norbu death, he had established seven chapels at the Rongbuk complex, four Sherpa monasteries near Tingri. It is one of the largest Monasteries in Tibet for Sakyapa Sect of Buddhism. The Sakyapa has a history of over 900 years. Its collection of Buddhist texts is especially impressive and they are kept in shelves known as Kunga Rawa. There are over 20,000 large and small volumes, valuable hand written manuscripts. Sakya is also the depository of over 3,000 thangkas and 20,000 sculptures which predates 14th century. It originally consists of two large complexes, Sakya North and Sakya South, constructed on the north and south banks of the Trum River. There were over 40 Chapels and monastic buildings; the earliest structure (Utse Nyingpa, Utse Sarma, Gorum Lhakhang, Zhitok Labrang, Lhakhang Shar) were all to the north. Sakya North, on the north bank of the trum was founded in 1073 by Kong Chogyal Pho and Sakya South was built by the Sakya Panchen (regent), Sakya Zangpo, on the orders of the famous Sakya Patriarch, Phagpa (1235-80). Shalu monastery is only monastery in Tibet known to possess a significant collection of 14th century. Newari-style wall painting moderated and enhanced by the artistic sensibilities of the Yuan dynasty of china. Arniko, a master painter from the Kathmandu valley, pioneered this unique art form that later came to full flower in the Chinese capital. Its foundation goes back to the 11th Century; it rose to prominence in the 14th Century. The architecture of Shalu is a rare combination of Chinese and traditional Tibetan elements, most strikingly represented in the multi level Chinese palace roofs with brilliant turquoise tiles that surmount a Tibetan temple. The Shalu Serkhang was conceived as the paradise of Chenresi and represented a religious haven from all hunger and poverty. It is believed that like holy mountains, lakes are also endowed with spiritual powers. 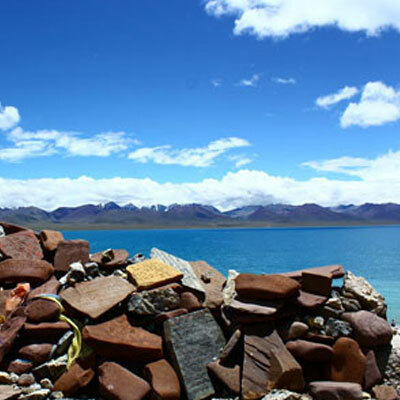 The remote portions of Lake Yamdrok Tso (4408m) and skirts holy Tonang Sangwa Ri, a mountain consecrated by Guru Rinpoche, a founder of Tibetan Buddhism. Beyond the lake are old caravan trails that lead to the district of Lhodrak and then on the Bhutan and India. 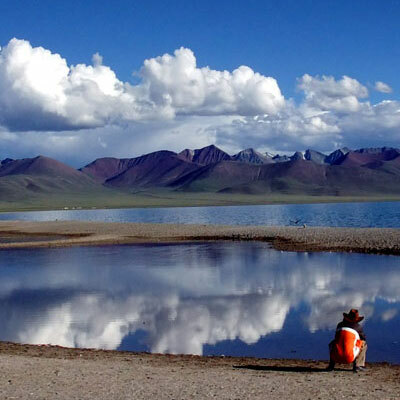 The eastern shores of Yamdrok Tso have a number of superb campsites; good places to spend a couple of rest days. It can be defined as a glimpse of an irretrievably lost era. The monastery here includes the massive temple of Palkhor Chode and the great multi-chapel Kumbum Chorten. These religious monuments “parts of Gyantse’s ancient monastic town”, contain some of the most extraordinary works of art in Tibet. Palkhor Chode Monastery is one of the cosmopolitan art style monasteries of Gyantse. It was built by Kunsang Phag between 1418 and 1425, and their building outer walls are painted a customary red. Within it are superb works executed during one of the most creative periods of Tibetan art; a time before the Tibetan styles became stereotyped and ubiquitous. The temple also is seminal from historical and icono-graphic points of view. It has two floors, with an additional single chapel superimposed on the second. Its main entrance opens to the south. The assembly hall has 48 columns and contains long row of seats where the monks perform their daily rituals. On the walls, wall painting depicts larger than life deities. On the left side of the hall’s entrance, next to the door, Acala with a sword is followed by the paradises of Vairocana, Manjushree (Jampelyang), Avalokiteswara (Chenresi), Sakyamuni, and Ratnasambhava. The style of this wall painting differs somewhat from that of the murals (paintings) in the assembly hall and is similar to most of the painted works in Khumbum. Gyantse Kumbum is a monumental Chorten, whose architecture is peculiar to Tibetan Buddhism. Kumbum denotes 100,000 images and the term derives from the creation of divine images in the myriad chapels. It is the most important Chorten ever built in Tibet and others have survived (Jonang, Riwoche, Gyang, Jampaling), but no one can compare to the majestic Gyantse Kumbum in term of design and artistic contents. The Kumbum has 64 chapels in its four lower floors. Its statues however, have suffered recent damage, and having been restored (some drastically), they have less artistic significance. The foundation of Gyantse castle (Dzong) is attributed by some sources to Phagpa Pal Sangpo (1318-70), who established his residence on the same cliff. After receiving the permission, he laid the foundation of a settlement in 1365. Kunga Phagpa (1357-1412) established a great temple (tsuglag khang) near the palace in 1390 and completed in 1397. The complex, named Samphel Rinpoche ling included an inner chapel (Tsangkhang), to which a Shalyekhang (top most chapel) and a Gonkhang (Chapel of the Wrathful Deities) were added. The temple has suffered through the ages; the Gonkhang no longer exists; only a few murals have survived. Lamas. Various unknown pilgrimage start from here. Near Shigatse are the Wuyuk and Tobgyal Valleys, home to highly respected Buddhist and Bonpo institutions. The famous Tashilhunpo (Monastic City) is situated in Shigatse. It is one of the principal monastery of Tsang Province, is one of the great six centers of the Gelugpa Sect and one of the largest, most vibrant monastery in Tibet, the only one that does justice to the term “Monastic city”. It was founded in 1447 by Tsong Khapa’s nephew and disciple, Gendundrub, the first Dalai Lama; it was substantially enlarged under the fourth Panchen Lama, Lobsang Chokyi Gyaltsen (1570-1662). (151km) is west to Shigatse on the Friendship Highway and has usual traffic stops here, mostly en route between Lhasa and Nepal. 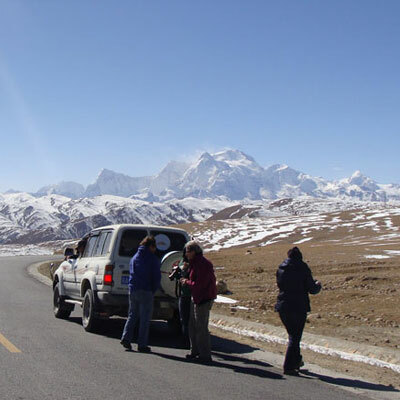 Our further journey goes across the Tibetan plateau with Spectacular Mountain views from Lalung-La pass (5050m). Passing through the old town of Tingri there are more views of the Mt. Everest and Cho-Oyu. Milareppa cave is one of the must stop for pilgrims. It is the site of Milarepa’s first one year retreat after completing his studies under Marpa, who divined the precise location of this powerful cave. He was completely sealed inside, and during the entire period, he meditated with a butter lamp balanced on top of his head. Prayer flags mark the site. A one room temple has been rebuilt around the cave; a stone wall is across part of the opening. The interior has an altar and thangkas, and a bare inner cell contains Milarepa’s footprint and carved Mantras.